If you were around, you might remember that 1959 was a year of some incredible things. You might remember the Montreal Canadiens and the Toronto Maple Leafs facing off in the Stanley Cup finals; York University was founded; and future Canadian rock star Bryan Adams was born in Kingston. It’s also the year that United Way came to Simcoe County. Though our name has changed over the years, our mission has been consistent: improve lives and build communities. United Way Simcoe Muskoka has spent 60 years making a local impact, and we aren’t slowing down. #LocalLove has been a mission since United Way Simcoe Muskoka was conceived. Originally under the name Barrie United Appeal, we started with the combined efforts of seven other social agencies in Barrie, to incredible results. In 1978, Barrie United officially became Barrie & District United Way, then expanded again in 1986 into United Way/Barrie-South Simcoe. But the more that United Way grew in our community, the more we realized that our neighbours needed our help. We have grown even more since then, becoming United Way Greater Simcoe County in 1999, welcoming United Way South Georgian Bay into our family in 2013, and finally becoming United Way Simcoe Muskoka in 2016. Today, United Way Simcoe Muskoka (UWSM) is working with agencies across our communities, bringing our 60 years of experience to those who need it most. United Way is an international organization that spans 40 countries and territories, while helping almost 1,800 communities. UWSM is part of that global movement, but our focus is entirely local. Focusing on #LocalLove makes UWSM unique among charities. 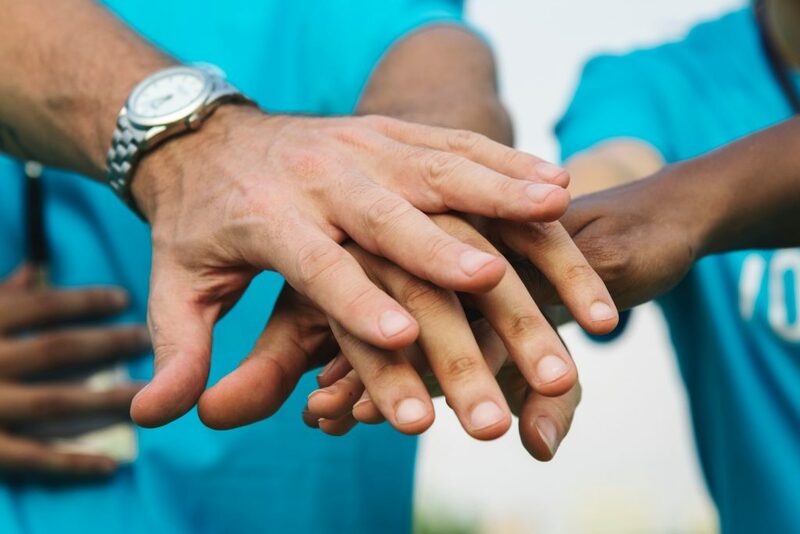 We have the expertise and partners to identify the most pressing issues in our communities, and we keep 100% of your donations in those communities. We know that the issues that we face in Simcoe Muskoka are not somebody else’s problem. These are issues that we see every day. Issues that we are helping our communities fix. By focusing on our local needs, UWSM supports and funds agencies and resources that make a real, lasting difference in the Simcoe Muskoka region. Strong oversight is given to every dollar raised, ensuring that it goes exactly where it is needed and where it will make the biggest impact. While you might know our name and may have seen us out in the community, you might not know how UWSM is able to make such an impact in Simcoe Muskoka. Like the many social issues that people face, there are many facets to how we approach helping our communities. Whether you live in Barrie, Collingwood, Midland, Orillia, Bracebridge or anywhere in between, one of our Partner Agencies is making a difference in your community. The biggest role of United Way fundraising is to gather the resources necessary for these Partner Agencies to operate. Many of our Partners would not be able to run the programs needed to make their impact if not for UWSM’s Community Fund. Gateway Centre for Learning is one of our Partner Agencies improving people’s lives. They have been able to pave a pathway out of poverty for residents of North Simcoe with their Steps to Success program—a program supported by United Way Simcoe Muskoka’s Community Fund. Some of our greatest changemakers are the youth in our community. UWSM recognizes that and helps our youth become those changemakers that we know they can be. Our Youth United program gives groups of youth, aged 14-24, the opportunity to not only think of incredible ways to help bring positive change to their community, but to realize those changes with a grant from UWSM. With a Community Partner to help them, these groups of youth have created community gardens, celebrated diversity in engaging ways and much more. Click here to find out more about Youth United. Our Women’s Leadership Council is a group of dedicated, like-minded women who invest in projects that have a positive impact on the girls and women of Simcoe Muskoka. Through hands-on philanthropy and a genuine desire to help our communities, the Women’s Leadership Council is a powerful driver of change in Simcoe Muskoka. The members of the Women’s Leadership Council are active volunteers within our communities. They network with community leaders and businesses to learn about the critical issues that our communities face, then invest in high-impact programming that creates real change. 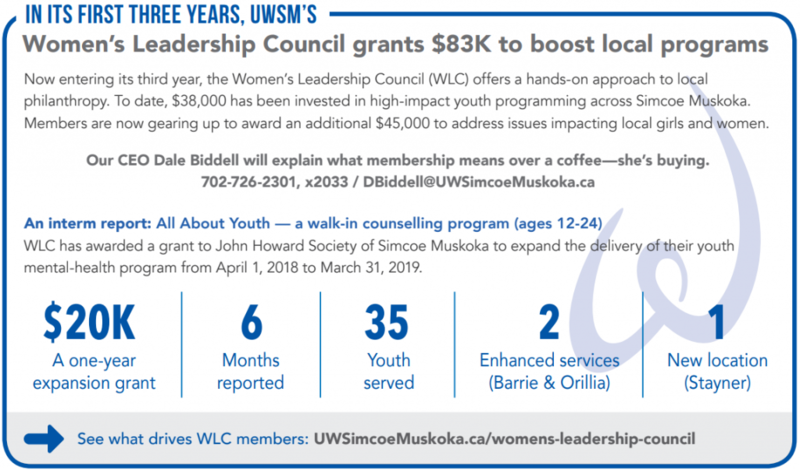 Click here to get more information about the Women’s Leadership Council or reach out to our CEO, Dale Biddell, at DBiddell@UWSimcoeMuskoka.ca. We want every dollar that goes into our community to have as helpful as possible. To this end, United Way Simcoe Muskoka is a forerunner among many charities through its operation of a social enterprise to bring in additional revenue. In an agreement with Ontario utility companies, UWSM runs an inbound call centre that assists families and households that are experiencing challenges with their energy costs. This enterprise earns revenue which becomes some of the funding that UWSM invests back into projects across Simcoe Muskoka. The call centre has created jobs, assisted thousands of households and allows your donations to go exactly where it is needed: back into the community. Click here to get more information about our social enterprise. Specializing in social events for social good, UWSM GenNext is a group of community-minded adults in their 20s and 30s. Their mission is to mobilize others like them to make a positive impact in our community through advocacy, volunteering and giving. GenNext leverages the passion of their generation to drive social change. Various events from networking to cooking classes are innovative ways of engaging and improving the lives in our community. The movement is not about financial or long-term giving but getting out and helping Simcoe Muskoka in new and exciting ways. Click here to read more about GenNext or contact Laara Losier to learn more at LLosier@UWSimcoeMuskoka.ca. Throughout the past 60 years, we’ve had the privilege of supporting programs that have affected the lives of so many residents of Simcoe Muskoka communities. United Way Simcoe Muskoka is investing more than ever in our communities and we are dedicated to improving the situations of everyone across Simcoe Muskoka. Social issues are not someone else’s problems, but problems that affect all of us. UWSM is dedicated to alleviating the issues that many of us face, and we have a plan on how we can get there. Thank you for an amazing 60 years of making a difference in Simcoe Muskoka. If you want to stay up to date on what we are doing and the changes we are making, click here to join our email list. We are active on social media, too! Follow us on Twitter and like us on Facebook to stay current on UWSM’s impact and events.